That’s the power (and patience) of the lovely teachers at Planet Cake, Balmain in action! The cupcakes were pre-baked and ready to use. 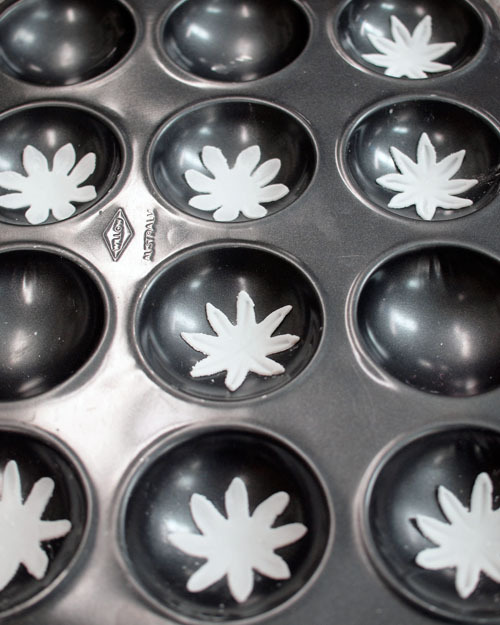 First we spread white chocolate ganache all over the cupcakes to create an even shape and surface. We are told this is also to keep the cupcakes moist underneath the icing. Thanks to my class-buddy for being my hand model! Mmmm, white chocolate ganache. Cream and white chocolate melted and whipped. It was made the night before and left to set until it became nice and thick. 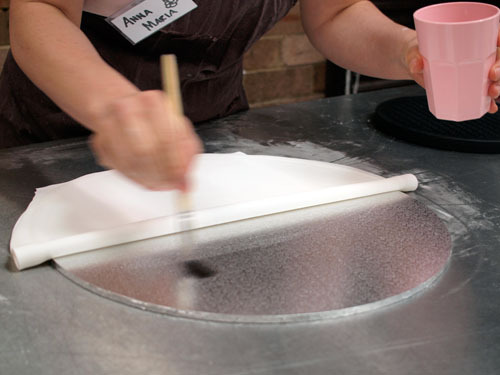 While the ganache is setting we are shown how to knead and roll icing (the ready-to-roll kind). It comes in massive boxes and we each get a little chunk to massage and roll out. 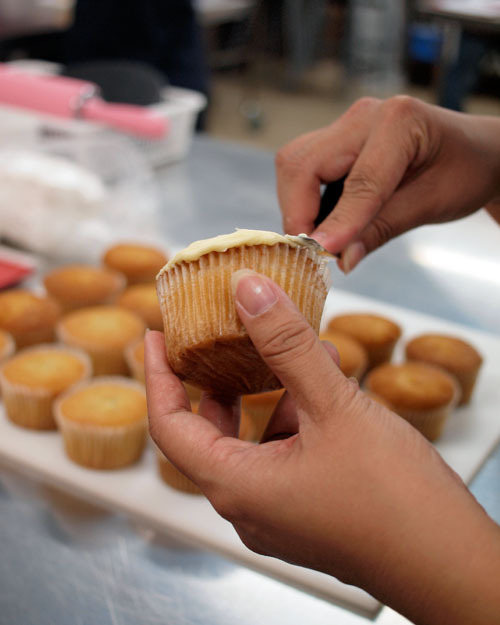 It’s a relatively easy process to cover the board which will eventually display our finished cupcakes. What I found most difficult was keeping the icing even and the same thickness. Next we made our decorations. These little flowers were first as they needed the most time to dry and firm up. 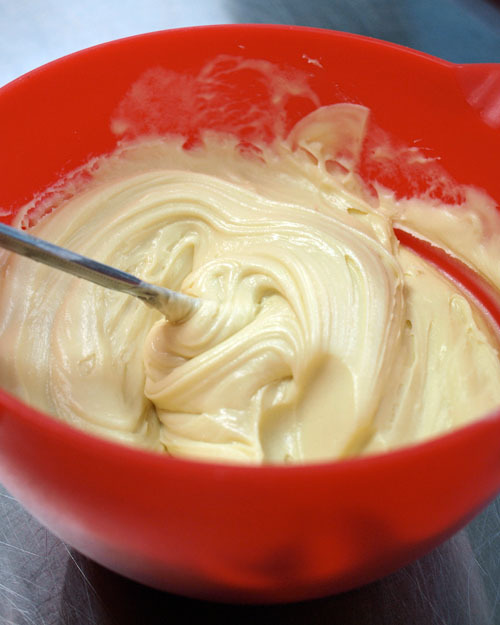 We used a pasta machine to get the icing nice and thin – a bit strange! I’m used to making spaghetti in a pasta machine! 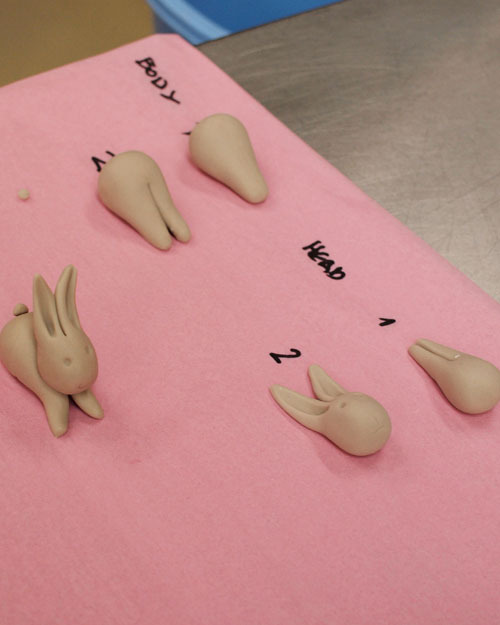 How to make the bunny rabbit model. Isn’t it cute? I thought there was no way I’d be able to make this little guy, but the teachers are so lovely and show you what to do every step of the way. Even a complete novice (with a terrible track record with art), like me, could make them. This little chicken was my favourite to make. He is just the cutest! I highly recommend the cupcake course at Planet Cake. It’s a long, jam-packed day (10am-4pm) but it’s completely worth it. Not only do you learn a long list of new decorating skills (modelling, piping, ganaching, painting and more) but you get to take home your efforts… and eat them! Great, huh? They also provide you with unlimited tea, coffee, water and cake as well as a very yummy lunch. Even if you’ve never done anything like this before, I urge you to have a go at one. You will absolutely love it. Click here to see a list of their upcoming courses. UPDATE 6/5/10: They recently had an Alice in Wonderland Cupcakes course. Click here to see my mate Lorraine’s beautiful creations! Christie attended the Planet Cake Easter Cupcakes Course as a guest of Planet Cake. ← Hot cross buns, a teeny bit late! What a fun thing to do. These cupcakes are gorgeous. I like the little ducks, too cute. ooh awesome. I have NO decorating skills, maybe I should try some day? Super jealous, would love to do one of their courses. You cupcakes look fab, so cute! These look great Christie! I think they turned out very professional looking…well done! Oh such lovely photos you have! (And cupcakes tooo of course). I am so excited to be doing my course in May! I took advantage of the 30% off they were offering. My first attemp at RTR icing totally freaked me out having no experience with it. are you shitting me with the cuteness? i can’t stand it. Well judging by your results I think you did brilliantly well. Love the rabbits. Those are gorgeous! Don’t think I would ever be capable of doing such a fabulous job ever. I tried this at Taste of Sydney and it was so much fun!! The bunny is so cute! I was pretty slow too haha, everything has to be just so! If you hadn’t told us you were somewhat challenged in the cake decorating department I never could have guessed it. They are so cute! I love the fluffy looking sheepies. Are they made with meringue frosting? They’re really cute designs! I like the lambs. It sounds like a fun day. Oh how cute. I love decorating cakes and cupcakes. I will definately check out their courses. Wow. My kids will love these! Thanks for sharing this one. I think my kids will enjoy decorating cakes! Oh wow, they are just so gorgeous you wouldn’t want to eat them!! True works of art Christie, they are fantastic. 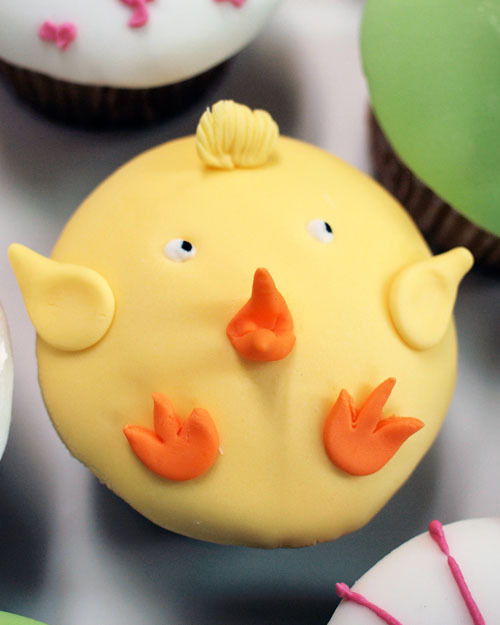 I ate the little chick cupcake. He was delicious! Being your class buddy and fellow slow poke, it was a great class at Planet Cake. Now all I have to do is try it at home without the guideance of the fantastic teachers. Adorable! 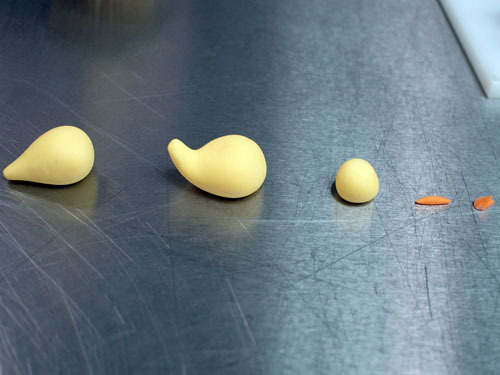 My favorite is the little chick one. how can i make the icing, pleas? The icing was pre-made blocks of fondant. You can buy these at good specialty grocers. 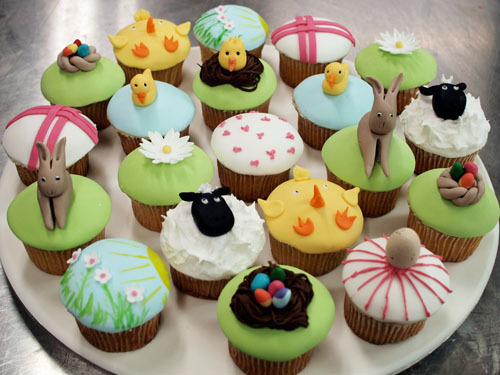 A great set of Easter cupcakes, they look adorable!